We as humans will always be curious of the unknown but what if the unknown happened right on your doorstep or to you. The production team known as Small Town Monsters are back with another documentary, and this time they come across various stories. 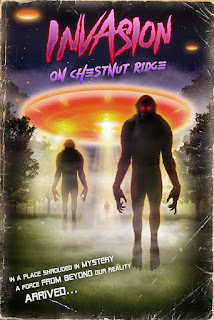 Using key witness accounts, documented cases and investigators stories they tell the story of the strange occurrences at Chestnut Ridge, Pennsylvania. Chestnut Ridge is a place that has had many stories emanate from over the decades and they range from the Kecksburg U.F.O. crash in 1955, various encounters with Bigfoot, man wolf type creatures, lights floating through the woods even stories of a bird like creature with wings over 8 feet long, known as Thunderbirds. Whatever you may think of these stories pieced together with local history, it all makes this an interesting documentary that will leave even the most sceptical among us willing to accept that not everything can be explained. Labels: Documentary, Invasion On Chestnut Ridge, Seth Breedlove, Small Town Monsters, Terror Films, U.F.O.